This new mascara from Shiseido is made with a thin, buildable formula that gives lashes major volume without clumping! 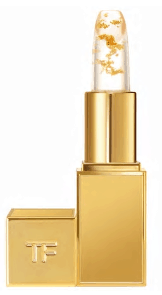 Before you gasp at the price of this Tom Ford lip balm, take note of the fact that it has actual pieces of 24 karat gold in it! This gift set from Benefit features two different brow pencils and a gel to help you create the perfect brows! Not only does this Buxom lip stain give your lips a great flush of color – it also plumps them! This set contains three different mini tweezers in an adorable travel case! This new eyeshadow palette by Stila contains a gorgeous mixture of mattes and shimmers! This face primer is infused with banana powder, which helps illuminate the skin! This blender reminds us of a delicious mint chocolate chip ice cream cone, so that’s pretty much all we need to say. 10 Of the Best New Products At Ulta!